Now that the season is turning, its fun to look at the upcoming spring fashion trends for 2018. If you’re at all like me, I tend to follow a particular style rather than trend. However, looking modern is nice and if a certain trend fits into my aesthetic, it’s fun to embrace. Here are a few 2018 spring fashion trends that caught my eye. I’d love to hear your take on these too. 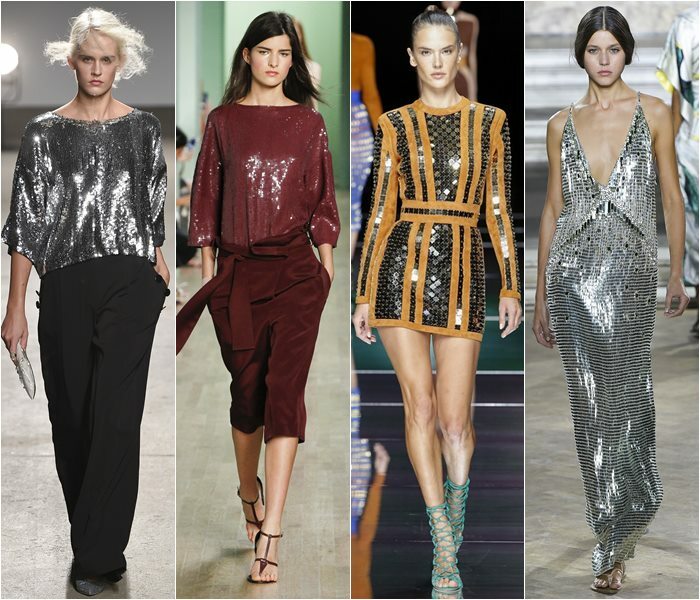 Sequins are typically a holiday trend, but not this season. Expect it to be in full force through spring and summer. Think tank tops, simple dresses, pencil skirts, trims on cardigans, etc. I love the idea of a sequined bomber jacket. Take a look at the Jalie Charlie Bomber, wouldn’t it be “killer”? A paper bag pant/skirt is defined as a pleated/gathered waistline that sits at the high waist. This waistline is perfect for belting and is flattering on the hourglass/pear-shaped figure. McCalls released their version this spring. McCalls 7726 is a recent make of mine, and I’m in LOVE with it. This classic seems to be everywhere from tops to bottoms. As sewers, we can take advantage of the different angles they offer. Plaids and stripes allow us to strategically create optical illusions to minimize/maximize parts of our bodies. Vogue 9293 gives us lots of options. Now that I’ve shared three of my favorite wearable trends, I’d sure like to hear about yours! Posted on March 9, 2018 by katieknobPosted in Spring 2018, Spring FashionTagged Jalie Charlie Bomber, McCalls 7726. Previous Previous post: What are you sewing?